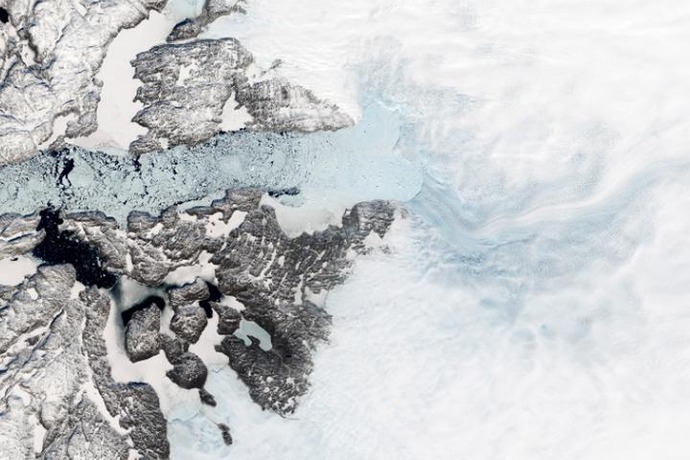 Greenland's fastest-melting glacier has stalled. But that's bad news. But since 2016 - and after 20 years of unprecedented melting in Greenland - Jakobshavn's rapid retreat has slowed down considerably and the glacier has even grown bigger. This might appear to be a rare dose of good news for the Arctic - a place that's heated up over twice as much as the rest of the planet. Instead, a team researchers led by scientists at NASA's Jet Propulsion Laboratory discovered that Jakobshavn's stagnated melt is only a temporary blip brought on by cooler ocean currents. Though worryingly, the recent slowing also carries ominous news for the thawing landmass. The research, published Monday in the journal Nature Geoscience, reveals that the Jakobshavn glacier - whose ice reaches some 2,600 feet under the sea - is extremely sensitive to changes in ocean temperature. That's a big problem because the dynamic ocean currents off western Greenland will naturally warm up again - on top of the reality that Earth's absorbent seas soak up over 90 percent of the planet's accumulating heat. These incessantly warming waters spell a grimmer future for both Jakobshavn and Earth's rising seas. "This study does not mean we are out of the water," said Luke Trusel, a geologist at Rowan University who had no role in the study. "In fact, I'd say it says the opposite by demonstrating just how sensitive this major glacier is to changes in the ocean." Trusel recently visited and published research on Greenland's accelerating melt. Jakobshavn is a big actor in the planet's future and Greenland's stability - a land that holds enough ice to raise sea levels by 23 feet. That's because Jakobshavn isn't a normal glacier. But while detailed projections of Greenland's melting are under heavy investigation, the greater picture in Greenland - continued, accelerated melting - is already clear. "This tipping point has started and there's no going back," said Michael Bevis, a professor of geodynamics at Ohio State University who had no role in the study. Overall, though, it's important to remember that Greenland's melting - and that of its major glaciers - will have some ups and downs within the greater accelerating melting trend. But this latest research means that the warming oceans - which wash right onto and beneath the Jakobshavn and other Greenland glaciers - will likely have an outsized role in adding to the planet's overall sea level rise. Our best current estimates for the globe's total sea level rise by century's end show the ocean is on track to rise by over two feet by 2100. But it could be as much as six feet. While the planet's carbon emissions continue to rise - and may not even peak for over a decade - Jakobshavn will continue to shed great masses of ice, even if that melting has temporarily slowed. "Imagine an iceberg spanning the length of several New York city blocks," said Trusel, who witnessed Jakobshavn's icebergs floating out to sea. "They're awe-inspiring and illuminate the magnitude of changes happening to the Greenland ice sheet."